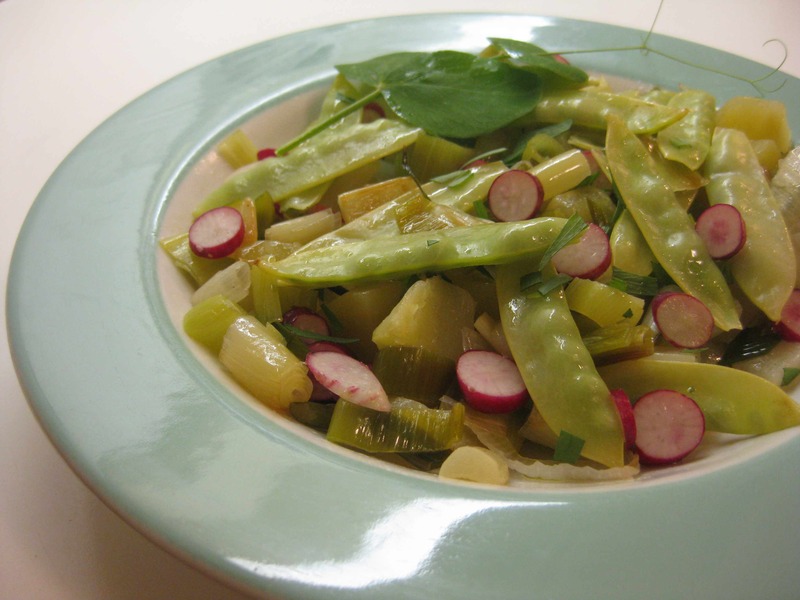 Mid-spring is the perfect time for a delicious medley of lightly cooked and raw spring vegetables tossed with warm potatoes. The combination of fresh tastes and textures with the base of potatoes makes this yet another transitional season dish. I’ve been discovering how well the seasons reunite full-circle as the fall’s potatoes or fat leeks over-wintered in the ground combine with spring’s fresh shoots and roots and pods and herbs. Here I combined tender Indian heirloom yellow snow peas and green garlic, with its curly scape, from my garden, French breakfast radishes from our CSA, and creamy yellow potatoes from the farmer’s market, purchased from people who are good at winter storage. Green garlic and radishes are pretty available at farmers’ markets now, so they’re not hard to come by. I haven’t seen new potatoes yet, but definitely will get some when available, as they seem almost a different vegetable from the storage variety. Green garlic is garlic that is harvested before the bulbs fully form, and is edible top to bottom. I’m pulling some from my garden rather than let the plants develop full bulbs since they need to be thinned out. Here, I diced the slightly bulging bulb and sliced the stems, greens, and scape, and lightly sauteed them in olive oil, less than a minute. I steamed potato slices until just tender (they continue to cook while cooling), removed them to a bowl and sprinkled them with white wine vinegar and a little salt, adding the garlic. I plunged the snow peas in boiling water (the water from the steamed potatoes) for 2-3 seconds and drained them, and I left the little radishes raw, slicing them into thin rounds. All of the vegetables were tossed with a tiny bit of olive oil, a pinch of salt, a few leaves of fresh tarragon and some pea shoots just before serving.